The Ma’an News Agency reports that two men have been injured by the Israeli Army this morning.The two were injured in separate incidents at approximately 10am and midday this morning. Both were apparently collecting stone aggregates east of Gaza City. Medics stated that both had suffered moderate injuries and were transported to Ash-Shifa hospital. 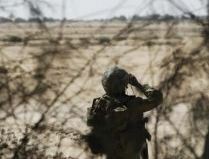 The Israeli military claimed that the two had come within a 300 meter no-go zone around the border area. The army alleges that the two were first warned to retreat and then warning shots were fired before the workers were shot in the legs.